The 2023 Summer Invitational is trying to ensure we don’t have “super” teams or all-star teams made exclusively for this championship event. All teams must be in the 2023 class and a team that competes year round. Only teams competing in AA leagues and similar-level tournaments will be considered. In order to be considered for this event, the club director must do the following. The 2023 Summer Invitational will use NCAA rules as a guideline with the following exceptions. Timeouts: 1 timeout per game per team, timeout is 1 minute in duration and officials will stop the clock on timeouts. Timeouts are only called as per ncaa rules once the team calling the timeout has possession in their offensive box. Overtime is sudden death until a winner. 30 second breaks after regulation, no side change. IF OT, each team will get one additional 30 second timeout. Spectators – NO spectators allowed directly behind either team bench – Each team is allowed two official photographers authorized by the head coach who are allowed to setup outside of the limit line anywhere along far sideline or along bench sideline between coach’s area and the endline. There is to be NO coaching by these individuals. Backcourt once ball is established in offensive zone. Player safety: High hits, egregious, dangerous slashes All rules in effect will be to encourage hard physical play with player safety at the top of mind. 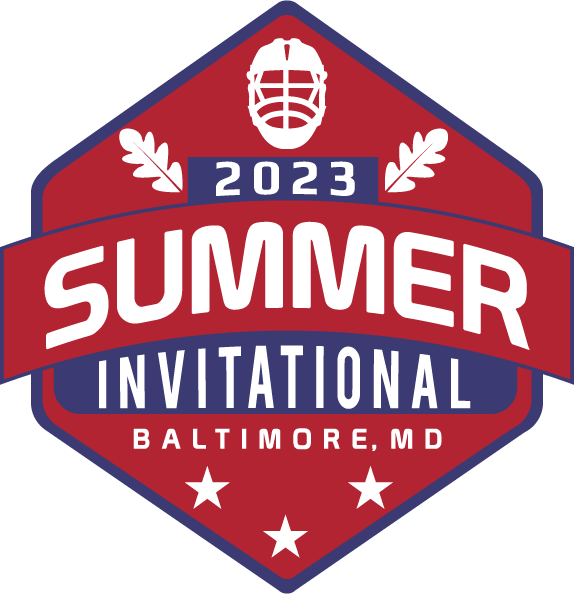 Avoidance of violent collisions – Body contact will be permitted in the 2023 Summer Invitational. Sports medicine research indicates that the severity of certain injuries may be reduced if a player can anticipate and prepare himself for an oncoming hit. Therefore, there is no justification for deliberate and violent collision by any player at any youth level, especially intentional player-to-player collisions with defenseless players (so-called “blind side” and “buddy pass” checks), checks involving the head and/or neck, and excessive body-checks (“take-out checks”). Therefore, the 2023 Summer Invitational will mandate that officials apply violent collision rules and utilize the most severe penalty option; game ejection, plus 2 minute un-releasable penalty. The 2023 Summer Invitational understands there could be improper ejections although we hope not to have this we all must understand if it happens its in the interest of player safety. Your players and your families need to be instructed, taught, and these rules need to be clearly understood prior to the event. **Ejection/Suspension: Player may or may not be allowed to return for the next game depending on severity of play. This will be a referee, tournament committee decision. Exceptional intent or egregiousness could result in expulsion from the tournament. Any hit delivered on a player in a vulnerable or defenseless position with over 2 steps. Should video be presented showing such illegal high late hits the tournament commissioner reserves the right to add to, suspend, or change the length of a suspension. SLASHING – Egregious and uncontrolled slashing will not be tolerated, especially if there appears to be “an intent to injure” and 2 minute fouls can be handed out. Hard, legal, checks are encouraged with the crosse is on the opponent’s crosse or his gloved hand/arm. Thus, any blow with the crosse anywhere else on an opponent is SLASHING, and must be called. A slash to the head or neck may incur a two- or three-minute non-releasable penalty. Egregious uncontrolled slashes will be defined as slashes to the back, head, legs, in a “baseball bat” type swing. SPORTSMANSHIP – This will be a very competitive event that we hope is played fast, physical, with sportsmanship by players, coaches, and spectators. While it will seem like the most important event in the history of the world to some, we ask that everyone attend the event for 14/15 years olds with perspective. We should change the current mold of youth lacrosse and expect all parties should exhibit the highest level of sportsmanship at all times. Coaches and officials should be partners in providing the best possible lacrosse experience for youth players. Unsportsmanlike conduct by coaches and/or players and/or spectators degrades the experience of youth players, discourages people from becoming or continuing as officials, and erodes the integrity and appeal of the sport. Therefore, unsportsmanlike conduct will not be tolerated. Obscenities need not be used in order for language to draw a penalty. Tone, intent, and body language can all contribute to unsportsmanlike conduct. The 2023 Summer Invitational expects officials to enforce the Unsportsmanlike Conduct rules without hesitation. FAMILY BEHAVIOR – Any parents, friends, grandparents etc acting in an inappropriate, crude, or unsportsmanlike manner is subject to an ejection. Said ejection could result in removal from the grounds at The John Carroll School at the discretion of the tournament director. This includes but is not limited to: foul language, taunting other teams or their coaches, taunting other parents in the stands, and taunting or berating an official. This is a great event for the teams that should in no way be negatively impacted by parents and their behavior. Please make your parents aware of this rule prior to the event, as there will be no “second chances” if they were not made aware of the rule. If behavior continues after sanctioning takes place, team could face penalty time enforced through the refs or disqualification from the event. Sunday, Play in games and consolation games Sunday morning.